Locations where Conan Exiles players can find Iron to upgrade their armor and weapons. In the world of Conan Exiles, knowing how to find iron and other resources can prove exceptionally handy but extraordinarily difficult. This is because new barbarians trying to identify these materials might not know what to look for or where to look. So, in an effort to help you get started, we're going to show you a few of the best ways to get iron. 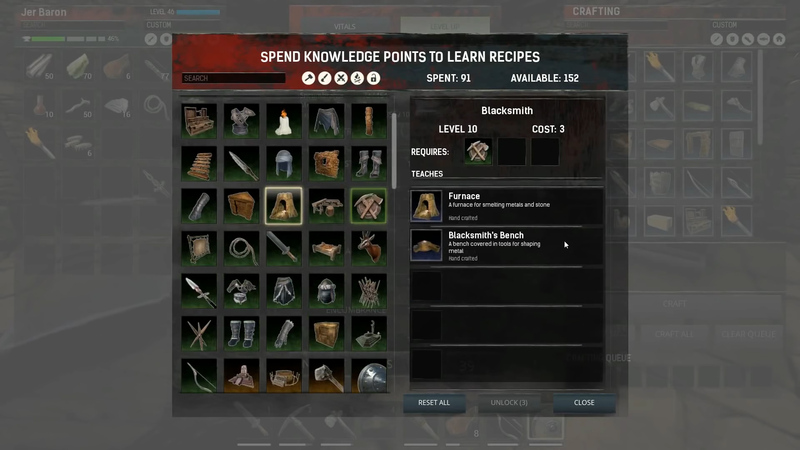 To harvest and craft iron tools, you’ll need to unlock the recipes Apprentice Craftsman, Carpenter, Tanner, Blacksmith and Journeyman Craftsman. The highest level you’ll need to unlock all of these is level 10. This means you can acquire this stuff fairly early in the game. Once you’ve unlocked these recipes, you’ll have to build a furnace and a blacksmith’s bench. The furnace is where you can smelt raw materials and use them to create weapons using the blacksmith’s bench. In order to smelt iron, you’ll need tinder such as coal, wood, or even branches. Most players find that using coal is the preferred method. If you’re still low level, infiltrating settlements to kill villagers help you find enough iron and coal to craft some sturdy weapons and armor. A good technique is to lure an unsuspecting NPC away from their village and attack them. This is also a great way to enslave thralls, because you’re unlikely to attract unwanted attention from fellow villagers. While not all villagers will have what you’re looking for, if you keep at it, you’re bound to get your hands on these materials. You can find the villages across the river from where you’ve spawned. Watch out for crocodiles and hyenas. Once you’ve equipped yourself with some armor, weapons, and a sturdy level, you can begin looking for iron in the mountainous regions of Conan Exiles. The reason you should wait to explore this area until you’ve reached a higher level with some nice armor and weaponry is because it’s plagued with hyenas, NPCs, and rhinos which you might have to fight off. Avoid the rhinos. If you're wondering how to find iron, it because it can be a difficult resource to locate but when you do, it’s very noticeable. Unlike sandstone that you can harvest everywhere, the nodes you’ll be looking for are a dark bluish-gray. These can be harvested by your pickaxe and can provide you with a significant amount of ironstone. The same applies to coal. 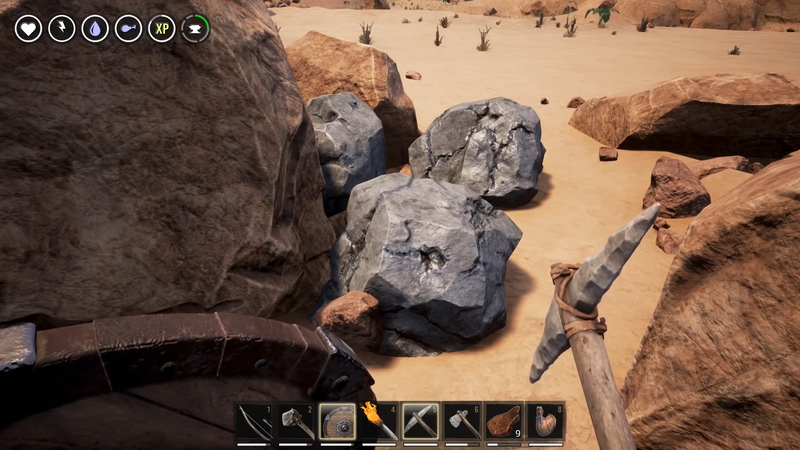 These rocks are black in color and can be harvested in significant amounts with your pickaxe. If you found this useful then be sure to check out our guide to changing your religion in Conan Exiles. 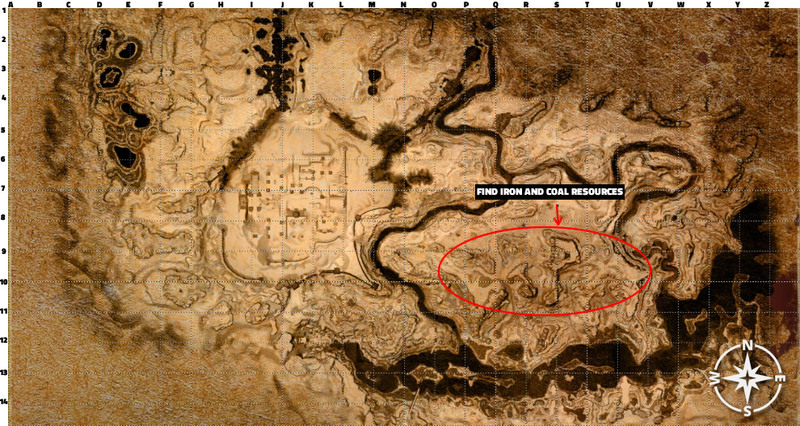 Hopefully, this has helped you and if you know of any other locations where players can find iron, let us know down in the comments and we'll update this article.